What has happened to architectural beauty? It used to be the fundamental value of architectural theory and practice, the touchstone of every conceivable achievement for a discipline that considered itself primarily as an art. Today, the word is seldom pronounced by theorists and professionals, at least in public. Even critics and historians tend to avoid the loaded term. 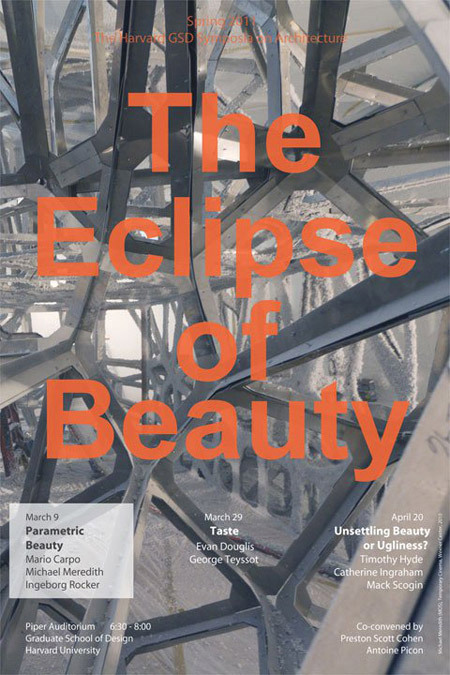 Its eclipse is all the more surprising given that architectural aesthetics is everywhere. The architectural star-system is to a large extent based on signature forms that herald the originality of their authors. The so-called “Guggenheim effect” has fundamentally to do with the visual seduction exerted by Frank Gehry’s project on a large public, from connoisseurs to simple passers-by. It has paved the way for all sorts of prestigious architectural commissions, often linked to the cultural sector, museums, libraries, opera houses requiring visually striking answers that can be appreciated by a broad audience. Usually entrusted to a relatively small cohort of elite architects, these commissions nevertheless contribute to define the tone of contemporary architectural debate. Even if the term beauty is rarely invoked to characterize their power of seduction, the aesthetic dimension plays a determining role. The GSD Technology Platform is a transdisciplinary initiative that fosters discussions about the interface of digital technologies and design. The aim is to uncover and explore how the digital medium is transforming the agency of design through contemporary technological innovation, project experimentation, social media and interdisciplinary collaboration. The Technology Platform provides a forum for transdisciplinary discussions and will host colloquia on a regular basis. The first colloquium “Visualizations : Realizations” focuses on the role data management and data visualization play in our daily material and perceptual realizations. With the further advancement of digital technologies during the past two decades, new methods of design and realization have begun to emerge involving the selection, management and visualization of data, in order to map, analyze, construct and reconstruct reality’s complexities and dynamics. Instrumental for this development are advanced forms of data imaging, open systems and information exchanges that transcend disciplinary boundaries and open new forms of collaboration and practice. The first colloquium will offer a forum to present current research on selected topics in 20-minute lectures, followed by a panel discussion with the invited guests and the audience. Questions regarding the selection, generation, evaluation, motivation, visualization of data and the repercussions thereof for the comprehension of nature and culture will be discussed. The sessions will be moderated by Ingeborg M. Rocker and Pierre Belanger.